Speaking of immunizations, as Patrick Angel did in the previous blog, here is an article on the subject written by Irene Caldwell O’Neill (SHS 1960). See “About” for more on Irene’s dream of creating a collection of Sharpsville memories. Some months after we [the Caldwell family] moved to Sharpsville, I needed to be vaccinated against smallpox for the coming school term. Mother kept telling me how nice the local Dr. Bailey was and how he would only scratch my arm a little and then give me a treat. It hurt more than any scratch I’d yet received and I cried even after being given a completely inadequate lollipop. A Band-aid stayed on my arm for several days, until the time Mother was to remove it and look for signs of the inoculation “taking.” It had to “take” or need to be repeated, a prospect I was very concerned about, sucker or no. I needn’t have worried. The huge red swelling on my upper arm felt as big as my head and proved that it had, indeed, “taken.” In a very short time, the big bump became an ugly pustule, that seeped and wept bright yellow ooze from its edges while a crusty scab formed over the center. As the swelling went down and the ooze dried up, a great itch inserted itself under the scab. I had been told by both doctor and Mother not to scratch. Their dire warnings promised “spreading” or even worse, “scarring” as the certain outcome. Mother’s smallpox scar was big, the size of a half dollar and looked, I thought, horrible. If that’s what scratching did, I wasn’t about to go near my scab. However, this itch was bad, worse than the worst mosquito bite. I tried not to think about it, but how could I not, when it screamed, “Please Scratch Me,” with a voice loud enough to keep me awake at night and interrupt every daytime activity? Many times throughout a day, I pulled my arm close to my face and inspected the dreadful site. One day I noticed that the scab edge was gradually separating from my skin. The scab eventually fell off with only a little help from me and my scar never did become as big as Mother’s. That was not my last shot from Dr. Bailey. Periodically that good doctor would show up at Robison Elementary School with the school district nurse and a folding table. Children lined up to have their arms swabbed and stabbed with the intent of preventing some potentially fatal childhood disease such as typhoid fever, diphtheria, whooping cough, or tetanus. When my parents were young, whole families of children often died from some such ailments. While we were to experience chicken pox, measles, mumps, and rather mild forms of influenza, nothing fatal struck the Caldwell children in the 1950s. 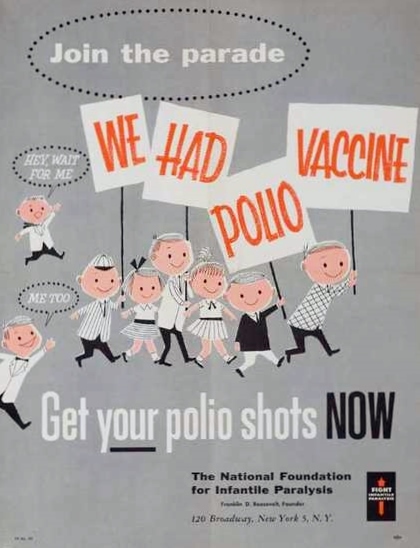 I saw evidence of only one case of polio during my childhood (even though it was much discussed and fretted over) while attending a birthday party. A boy came wearing leg braces. In 1957, the Jonas Salk polio vaccine came to Sharpsville and was administered free of charge to the town’s schoolchildren. Once a month, for three consecutive months we lined up to get a shot that, blessedly put an end to many parental fears and freed us to use the Buhl Park pool without worry. [My brother] Jack, hearing talk of three shots, thought all were to be administered at once and dutifully visited two of the three tables set up merely to move students through faster before he fainted. Tuberculosis (TB) had been a huge killer in the U. S. until its origin and means of spreading were understood and addressed. The banning of public spitting alone worked miracles and with the development of streptomycin in 1943, soon followed by other antibiotics, a cure was found. Although the disease was already rare in the 1950s we were still tested for it every year at school by the patch test. Aside from the occasional false positive due to a prior exposure, TB also dropped off the list of our mothers’ worries. My family never had a prescription filled during my whole childhood. We used over-the-counter products including iodine, cod liver oil, hydrogen peroxide, witch hazel, calamine lotion, Fletcher’s Castoria, Vick’s VapoRub, milk of magnesia, Mercurochrome, aspirin, and carbolic drawing salve as home remedies for most illnesses, usually purchased at Uncle Clifford Caldwell’s drug store on State Street in nearby Sharon, Pennsylvania. We didn’t own a thermometer and Mother guessed by touch at the severity of a fever, applying cold cloths to lower a temperature. Somehow we survived to adulthood as did most children in 1950s Sharpsville. See Also Dr. Bailey’s Sharpsville 1920s, Part I and Part II. — Irene Caldwell O’Neill (SHS 1960), Escondido, California, March 2013.